The year was 1818. The month was December. James Monroe was in the White House as our fifth President. The War of 1812 had been over for nearly four years and Spain had ceded Florida to the United States as a result of the Seminole War. There were now 21 States in the Union with Illinois just being admitted. A few miles from here, Ralph Waldo Emerson was busy writing essays as a freshman at Harvard. Many miles away, Washington Irving was in the middle of writing "Rip Van Winkle" and "The Legend of Sleepy Hollow." What was happening here in Needham in 1818? Well, the paper mills of Amos Lyon and Company were in full production, as was Rufus Ellis' cotton factory. But most of Needham's more than 1000 residents made their living as farmers, tradesmen, and craftsmen. 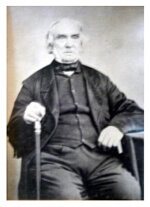 Among the latter group was a 25-year-old carpenter and furniture maker named William Eaton. Since William Eaton was skilled in carpentry (in fact some of the houses he built are still occupied as residences in Needham) it is not surprising that he was asked to build the coffin for a John Beaverstock who died that December. This in itself would scarcely be notable. What does make the incident worth noting is that it marks the start of what is Needham's oldest operating business... and the founding of one of the oldest family owned funeral directorships in all of the United States. Throughout much of the 19th Century funerals were kept very simple and concluded very quickly. Services were almost always held in the home of the deceased. It was quite natural that the man who supplied the coffin would also be responsible for transporting it to the cemetery by wagon. 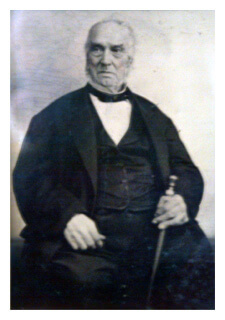 Thus, William Eaton found himself becoming more involved in handling the details of funerals for his friends and neighbors in the community. However, he was never a "funeral director" in any sense of the title. It would be a great many years before a funeral service would shift its emphasis from being a simple tribute to the dead to becoming a consolation for the living. By the middle of the 1800's William's son George was helping him conduct funerals. This always remained, however, an incidental part of his livelihood. George was primarily in the insurance business. 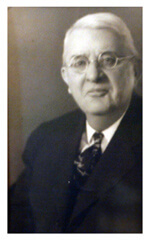 It was Alger E. Eaton, George's son, who represented the third generation in funeral service. Alger was born in 1863 and was active in the family firm until his retirement in 1940. He started out by working with his father on the farm and later helped him with his insurance and funeral responsibilities. Then in the early 1890's he bought out his uncle Everett's livery business. By 1900 he'd expanded so that it included a stable with 23 horses, farm wagons, carriages, sleighs, pungs (a type of sleigh), hacks, and a hearse. 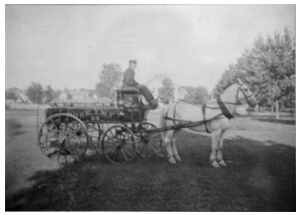 He supplied the horses that pulled Needham's fire-fighting apparatus, and Alger E. Eaton's was the first firm in the area to establish an automotive taxi service. Once again it is easy to see that "funeral directing" in Massachusetts was pretty much a sideline for the man who got involved with those chores as well as his regular business obligations. But one significant advance came about in 1906. The legislature passed a law requiring any person practicing embalming to be licensed by the State. Alger presented himself before the State Board in Boston and received Massachusetts Certificate No. 191, which he held until his death in 1943. Soon after World War I, many of the features we now associate with funerals were put into practice. An important development was taking place where funerals were transcending the old limitations and were becoming services for the living as well as for the departed. One of the major innovations was the "funeral home". During the 1920's Alger Eaton was one of those funeral administrators who, with increasing frequency, made part of his residence available to the public for services. As time went by, he realized he needed larger quarters and, in 1928 purchased a building in the business section of town. This is the property that, greatly expanded, is still being used today. Ideally located on Highland Avenue, between Needham and Needham Heights, it was established as a funeral home right from the start. Alger and his family lived up stairs and the entire first floor was devoted to funeral facilities -- the one aspect of his enterprises that had come to receive more and more of his attention and time. In the 1920's funeral directing became the one profession that the Eatons, from that time on, would devote their interests and talents. This change was inevitable as Alger's two sons, Laurence E. and Chester W., came to have a stronger voice in decision-making for the firm. After completing their education in Needham schools, the two boys went on to college. Laurence E. graduated from Norwich University in 1923 and Chester from Dartmouth in 1925. They then became licensed funeral directors by passing the Massachusetts State Examinations and began full-time careers with their father. A new generation in the firm meant new ideas. In 1929 Laurence E. and Chester recommended that the family dispose of all other interests and concentrate on offering Needham and the surrounding communities an exemplary funeral home in the best and truest sense of the term. Thus, the break with the past became complete. The funeral directors had now earned recognition as the men to whom the community could turn to for knowledge and assistance in the event of death. The organizational ability, professional training and facilities eliminated the confusion of troublesome details. Their understanding softened the sting of sorrow and they were a reassuring hand in a time of greatest need. Funeral directing has long been an honored, full-fledged profession. 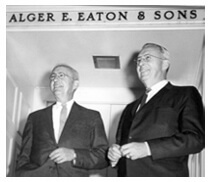 It is nothing less than an affirmation of this fact that the fifth generation of Eatons carried on the family enterprise. Like their fathers before them, the men of this generation channeled their interests toward this profession at an early age. All of them worked at the funeral home while attending Needham High School and all of them grew up in the spirit of a tradition that was already well over a century in the making. In 1950 Laurence's eldest son Laurence G. graduated from Norwich University and entered the New England Institute, a Boston school for funeral directors. He passed the State Examinations the following year and thus led the fifth generation into the firm. Following him were his two brothers, Stephen and Robert, and his cousin, Richard (Chester's son). 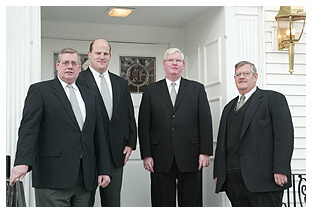 All had graduated from their fathers' colleges -- Stephen and Robert from Norwich University, and Richard from Dartmouth., and all joined the firm in the same year of 1954. 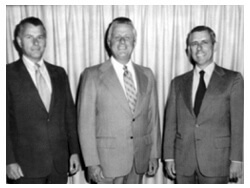 In 1970 Laurence R. came into the firm, thus becoming the first member of the sixth generation to do so. He was joined in the intervening years by his brother David. These young men along with Kevin Greene, all licensed funeral directors and embalmers, and funeral assistant Robert T. Timmerman, help carry on the Eaton tradition in its striving for excellence. The Eaton family has been in operation for three centuries, and as of 2018, for 200 years! With the amount of time devoted to the funeral industry, we feel we are one of the leaders in providing the best care to the families we have served, and continue to serve, generation after generation.